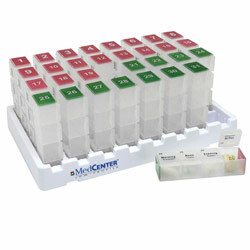 "Organize Your Pills For An Entire Month"
The MedCenter Monthly Medication Organizer is a 31-day organizer and reminder system for your pills, medications and vitamins. It's the perfect tool to help you keep your personal health plan on track It will save you time tracking medicine and reduce the chance of missed or duplicate doses. In this Low Profile model, the rows are all at the same level so that the unit sits lower on countertops and takes up less space.